A poignant chronicle of life as a prisoner of war and a testament to a man's love of his family. In December 1941, Major Kenneth Baird of the Winnipeg Grenadiers was captured by the Japanese after the fall of Hong Kong. He, like thousands of other Canadian, American and British troops, was not to see his home or his family for four years. To keep his sanity during those four long years, Kenneth Baird wrote regular letters to his wife Molly and young daughter Harvelyn. The penalty for writing was instant executionby the Japanese and despite the great danger Baird continued his mission, hiding the letters in a rubber boot and burying it. When he was released in 1945 he carried home the tattered notes, scribbled on scraps of paper and edges of newsprint. 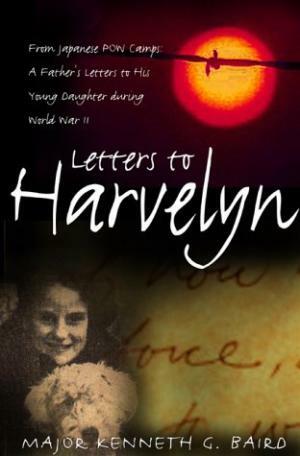 'Letters to Harvelyn' is Baird's touching chronicle of life inside a Japanese prisoner of war camp. He details the horrifying sicknesses suffered by the men, the starvation diet that consisted of a few tablespoons of rice every day, the insects, stifling heat and exhaustion. But rather than an account of despair and misery, Baird's letters are full of hope andlove, infused with a towering strength of will and a tender need to shield his wife and daughter from the horror of his true situation. He jokes how when he gets home he will install an extra stove in the kitchen to supply him with all the food he will need to lose his "sylph-like figure". Distressed about the imminent and painful death of a friend, he talks about the soldier's strength of character and apologizes for being so down. Interspersed with Baird's correspondence are letters from Molly and Harvelyn, glimpses of a little girl growing up, of summers at the lake, all the everyday happenings in lives struggling to retain a veneer of normalcy. Included too are newspaper clippings and photos from the period, war reportage that provides a fascinating counterpoint to the reality experienced by Baird. A moving never-before published account, 'Letters to Harvelyn' is a tender memoir and moving testimony to the courage and resolve of an ordinary Canadian in an extraordinary situation. Major Kenneth Baird served with the 44th Battalion in WWI where he was wounded and in WWII where he was a prisoner of the Japanese from December 1941 to August 1945. He retired in 1955 from a civil servant position and died in 1957. His daughter, Harvelyn, had his letters transcribed and recently made them available for publication. Harvelyn lives with her husband in Victoria, British Columbia, Canada. This book is unlikely to be published in the UK. Kristin Cochrane, Director Special Markets, Harper Collins Canada, 55 Avenue Road, Suite 2900, TORONTO, ONTARIO, M5R 3L2, CANADA.